Residence built by Purniah in Yelandur, now a museum. Purnaiah (Purniya) (1746 - 27 March 1812), aka Krishnacharya Purniya or Mir Miran Purniya was the Dewan of Mysore. He served under Hyder Ali, Tipu Sultan, the English, and Maharaja Mummadi Krishnaraja Wodeyar. He was known for his skill with accounts, prodigious memory, proficiency in several languages and sheer hard work. He was also a wartime military commander while serving under Tipu Sultan. After Tipu Sultan's defeat, Mummadi Krishnaraja Wodeyar was educated and trained by Purniah. From 1799 till 1810 (when Krishnaraja Wodeyar III came of age), he governed the Kingdom of Mysore together with the English resident of the East India Company. Purniah came from an Orthodox Marathi - speaking Madhwa Brahmin family. He was born in 1746 CE. He lost his father at the age of eleven and had to seek employment to support his family. He started writing accounts at a trader's shop. This grocer had close contact with a rich merchant, Annadana Setty, who supplied large quantities of groceries to Hyder Ali's palace and army. Through this connection Purniah very soon earned confidence of Hyder Ali because of his proficiency in accounting and excellent handwriting. Endowed with prodigious memory, proficiency in several languages and sheer hard work, Purniah became head of Accounts Department and a confidant of the ruler. Purniah knew Kannada, Sanskrit and Persian. He understood English, but could not read or write the language. Purniah attended every military campaign Tipu Sultan led. In the Third Anglo-Mysore War of 1792, Purniah commanded a rocket units (131 men). In his last battle with the British, Tipu had entrusted his eldest son and heir-apparent to Purniah's care. In the Fourth Anglo-Mysore War, Purniah commanded the forces of Mysore against the English in some of the battles including Battle of Sultanpet Tope. Tipu died on the battlefield in 1799. 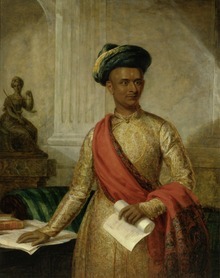 After Tipu's death Purniah sought an interview with the General Harris, who was very much impressed with Purniah's political acumen, maturity and fearlessness. He informed the General that administration had nearly collapsed, many of the able army and civil officers were killed and plundering had already set in. The British were convinced and made Purniah the first Dewan of the newly formed state of Mysore. Queen Regent Lakshammanni readily agreed to the arrangement. The child-king, later Mummadi Krishnaraja Wodeyar, was educated and trained by Purniah. He was granted the jagir of Yelandur, which yielded an annual revenue of 10000 star pagodas, by the Maharaja of Mysore at a special Durbar on 27 December 1807. The British Resident Sir John Malcolm and the East India Company honoured him on his retirement by presenting him a horse, an elephant and a rich killat. Krishnaraja Wodeyar attained the age of 16 in early 1810 and hence attained the age of discretion. After discussing with the British Resident, A. H. Cole, the reins of the state were transferred from Dewan Purnaiah to the king. Purniah retired from service in 1811. After his retirement from service in 1811, Purnaiah lived at the house is known as Lord Harris's House or The Doctor's Bungalow or Puraniah's Bungalow in Seringapatam, near the Scott’s Bungalow and Garrison Cemetery, and died there on 28 March 1812. Days before his death, he wrote a letter to his friend Col. Hill, Commandant of Seringapatam, Old and infirm, after a life of unusual activity and care, I am going to the land of my fathers, for which Col. Hill replied Say I am travelling the same road, and passed away a short time after Purnaiah. A tablet on the wall of this house records the connection of Lord Harris and Puraniah to this house. The photo of the bungalow at Bangalore shown as that of Purniah is actually that of his grandson Sir P. N. Krishnamurti, who was also Dewan of Mysore during the first decade of the 1900s. Purniah's bungalow is at Yelandoor, which is now a taluq headquarters at Chamaraja Nagar district. This Yelandoor bungalow is now developed as a museum for Dewan Purnaiah's memory by Karnataka Government. Purniah's first concern was law and order. He suppressed the revolting Palegars (local chieftains) who had become despots. He started releasing cash allowances to Mathas, temples and dargahs, which the British had stopped after Tippu Sultan's death. He opened a judicial department for peoples' complaints. His public works have left a great legacy. About nine mile canal was dug to supply drinking water to Mysore. Several tanks were dug. A stone bridge, dedicated to Marquess of Wellesley, the Governor General was constructed across river Kaveri connecting Srirangapattana with Kirangur. It has stood stead fast for the last two hundred years. Large number of choultries were built in the name of Maharaja of Mysore, but people called them "Dewan Purniah's Chatras". They were available to all travelers. Revenue administration was streamlined. Mysore state had a volatile border with incessant skirmishes, a legacy of the previous regime. Methodical land surveys were conducted. Borders were notified. Posts of Shekdars, Amaldars and Tehsildars were created which came down to modern times. He was honoured with big grants and a large pension. His desire to make his position a hereditary one, just like that of a ruler, did not materialise. Purniah is remembered for laying the foundation of sound administrative machinery for the state. Mysore came to be recognised as one of the foremost progressive native states in British India. ^ Western colonial policy: a study on its impact on Indian society. Institute of Historical Studies. 1981. p. 257. ^ a b c Parsons, Constance E (1931). Seringapatam. H. Milford. pp. 155–157. Retrieved 25 September 2015. ^ , Page 5 of Rockets in Mysore and Britain, 1750-1850 A.D.
^ [permanent dead link], Wellesley Bridge Pictures. Wikimedia Commons has media related to Purnaiah.